OraChill Dental Pain Control System - Drug-Free & Natural - NEW! Do your teeth, braces, and mouth hurt from an orthodontic adjustment or dental surgery? Before you reach for the bottle of painkillers, consider using drug-free OraChill® - a natural way to make your braces stop hurting! This product, a new version of gumEase, is a whole new way to look at orthodontic and oral pain relief. It is a mouthpiece made of medical grade polymer, filled with freezable non-toxic saline solution. You freeze OraChill in your home freezer, then apply it inside your mouth as needed. 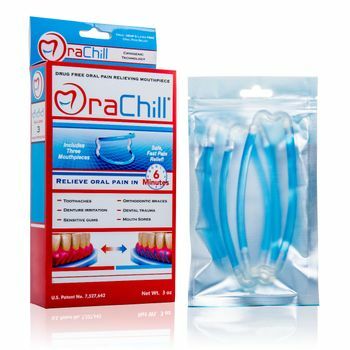 When you place a frozen OraChill mouthpiece inside your mouth as directed, it blocks the pain that comes from the nerves inside your mouth and jaw. The result is, the nerves in your mouth and jaw temporarily stop transmitting pain impulses to the brain! OraChill can help stop a large part of your orthodontic pain when you first get your braces on, or after an orthodontic adjustment. When used before meals (along with some dental wax to prevent irritation), it can help you eat more "challenging" foods -- so you don't need to limit yourself to soft foods all the time! Use OraChill any time you suffer from any type of oral pain, whether it's from an orthodontic adjustment or other types of dental work or dental surgery. Each box of OraChill contains 3 identical mouthpieces, in a re-sealable pouch. Place all 3 OraChill mouthpieces in the freezer for at least 6 hours or over night. The OraChill must be frozen before use. When frozen, open one OraChill mouthpiece pouch. Hold only by the clear hinge and bend it into a mouthpiece shape. Holding only by the hinge push OraChill back between your cheeks and gums - in front of the teeth and braces, avoiding direct contact with your teeth. Then spread OraChill apart as far as possible, to the top of your upper gums, and the bottom of your lower gums. Please note, you don't put OraChill on your BRACES; you place it far into the tops and bottoms of your GUMS, where your nerves are that transmit the pain. Leave the OraChill mouthpiece in place for two minutes. Then, remove it and replace it with the second chilled OraChill mouthpiece. Leave in place for two minutes. Then, remove it and replace it with the third chilled OraChill mouthpiece. The entire process takes about 6 minutes. Between uses, clean the OraChill mouthpieces with warm soapy water or a retainer cleaner such as Retainer Brite (using only warm water, not hot water), or wipe them with some Cleanse Freshen Go (towelettes or spray). Place back into the freezer to use again. OraChill component parts are manufactured in the USA. It is a safe alternative for pregnant, drug-sensitive, cardiac, and other medically compromised people. Each OraChill box contains 3 mouthpieces, which are totally re-usable. Just keep the 3 mouthpieces in your freezer and use them as often as you need, as many times as you need. OraChill is latex-free and DEHP-free. It has been FDA approved and successfully tested in patient trials. Each OraChill box contains 3 mouthpieces, which are totally re-usable. OraChill is latex-free and DEHP-free. It has been FDA approved and successfully tested in patient trials. Full instructions are included with the product. Each OraChill mouthpiece is filled with a non-toxic saline-based solution. This is a really cool product, and it really works! Just freeze the mouthpieces and you'll get drug-free relief from the pain of braces or other dental work. We're really happy that GumEase has relaunched and improved, and is now called OraChill! We're sorry, but we don't have an answer for you. The manufacturer is re-developing the product under a new name, but it is not ready for retail sale yet. We hope that it will become available again sometime in 2017. When it does become available again, we will make an email announcement, so sign up for our mailing list! Wow! This new mouthpiece works great! Cons1 of the 3 mouthpieces started to leak a little bit after about 15 uses or so... It was just very salty. I was skeptical, but this really helped to stop the pain from my daughter's braces just like it says. I feel better about her using this than taking a lot of Advil or Tylenol. Thank you!! What a relief for mouth pain! I looked everywhere for Gumease until I discovered it is now Orachill. I bought these before my first day of braces so I could be ready and prepared to ease my pain come my braces day. I had these in the freezer the day before my dentist appt ready for the next day. So happy I did! As soon as I got home I popped these in and they were so soothing. I highly recommend these for anyone with any kind of mouth pain whether it is braces or mouth pain. Sometimes I even wear them at home when not in pain so my brackets don' touch the inside of my mouth and so I don't have to keep putting wax on as it falls off. I was hesitant about this product, but it works really well for my son's new braces pain. I would recommend it! ConsYou need to keep refreezing it, but it's not a big deal really.